I've been on the hunt for some lovely alternatives to the standard Royal Mail postage stamps for both UK and international post. 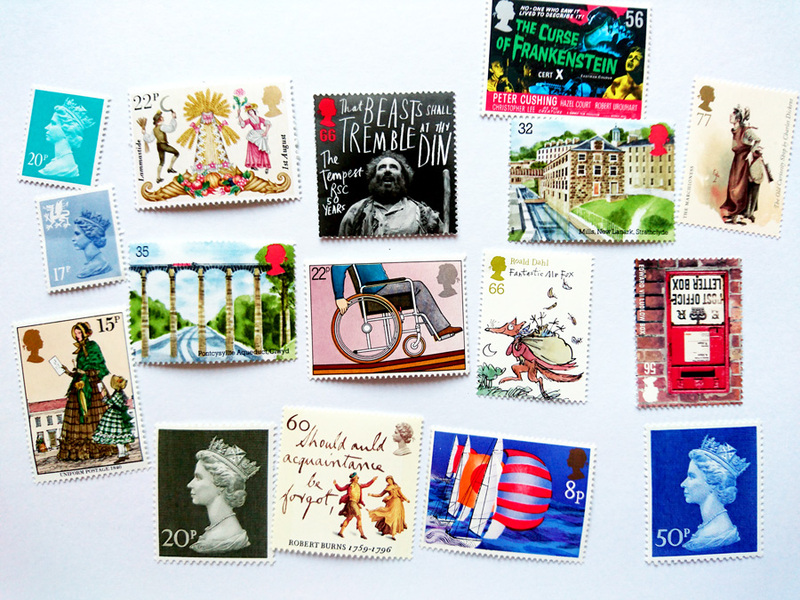 I did stumble upon a stamp store in Brighton last year, but I got caught up in an intellectual fracas about the investment potential of stamp collecting and had to hightail my not-coping 8-month-pregnant brain out of there (I managed to buy 10 1st class stamps before I made my exit). Resuming the search online, I found Philatelink and the Dauwalders of Salisbury (via Collect GB Stamps), which have exactly what I'm after... varied beautiful vintage postage stamps. Philatelink offers free postage on all purchases, which is brilliant for keeping your per-stamp costs down, and had despatched my order so quick, it arrived the next day. The only surprise was that I ordered specific-value stamps (e.g. 50p to 97p) for their image, but didn't realise that they are a random mix as well. Fair enough, and I'm not bothered, but some people might be, so worth mentioning it. Local UK stamps (1st and 2nd class) have been presented in the Machin series, a sculpted profile of the Queen's head, since 1957 and varies only in colour from year to year. The beauty of vintage British stamps, is not only in a more exciting artistry (no offence, Queenie) than the definitive stamp in use, but also in the value. First-and Second-class stamps are known as non-value indicator (NVI) postage, which means that they don't have a currency value printed on them. This was done to prevent wastage and the need to produce small price value stamps to make up the postage after a price hike. Therefore, these stamps can be used even after the price has gone up, and you can often buy them at a discounted price (just be sure to factor the cost of P&P for your online purchase into the equation). While I've got local post covered easily with a selection of vintage NVIs, international post isn't so easy. I have heard of Worldwide NVIs, but haven't yet found any that I liked, so I'm getting a mix-and-match bag of various values to make up the postage myself. It could end up taking quite a number of stamps to reach the basic value (£1.33 up to 20g letter), but should be fun creating a visual compliment to the envelope, especially with one that's almost half the size of a C6 envelope! My favourite. So, all that's left to know is...where do you buy your stamps?